for Roseville area families all under one roof! Shop 30,000 square feet of bargains! Everything's organized by size, gender and category. Free Admission - More items added! All Team Members and Consignors SHOP EARLY at the Half Price Sale Saturday. Finding great deals on items I can't always find someplace else! "I can buy nearly-new clothes for my active kids for very little money--good brands, too! I love taking the items my kids can no longer use and turn them into clothes they can wear and toys they can play with! 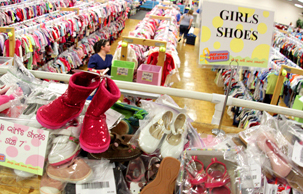 JBF pays better than any consignment store in the area. I love being a part of it."